With the Roundhouse/Dome Cluster there is a possible third bedroom, game room or home office in the roundhouse loft, 2 baths, separated bedrooms, large walk-in closets, dining area next to the windows, and lots of south-facing doors and windows. 1,314 sq. 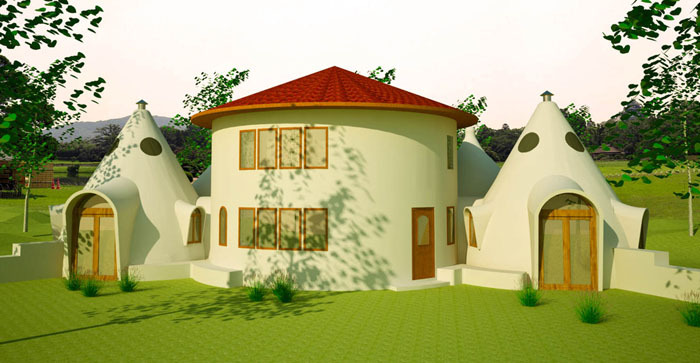 ft. interior including lofts in the roundhouse and both large domes, 2 bedroom, 2 bath; footprint: 31′ x 70′. The other version, has three two-story roundhouses (pictured above). There are a lot of things to like about this design: possible third bedroom, game room or home office in the main roundhouse loft, 2 baths, separated bedrooms, large walk-in closets, dining area next to the windows, and lots of south-facing doors and windows. 1,414 sq. ft. interior including lofts, 2 bedroom, 2 bath. Center roundhouse is 24′ interior diameter. Bedroom roundhouses are 16′ interior diameter; footprint: 31′ x 65′. Is it possible to get this plan including the basement shelter as described in the other two storey round house plan? There’s no basement with this plan. 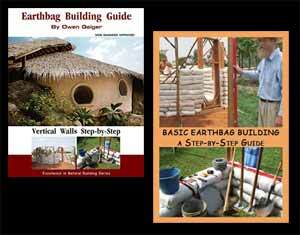 You can get an engineer to design the foundation. Plans are available through Dream Green Homes.com.